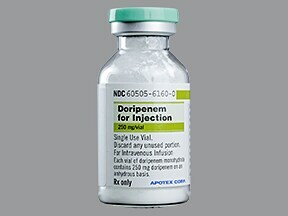 Doripenem is used to treat a wide variety of bacterial infections. This medication is known as a carbapenem-type antibiotic. It works by stopping the growth of bacteria. 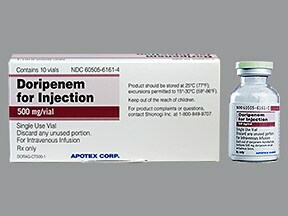 This medication is given by injection into a vein, usually every 8 hours or as directed by your doctor. It should be injected slowly over 1 hour. The dosage and length of treatment is based on your condition and response to treatment. Continue to use this medication until the full prescribed treatment period is finished, even if symptoms disappear after a few days. Stopping the medication too early may allow bacteria to continue to grow, which may result in a return of the infection. 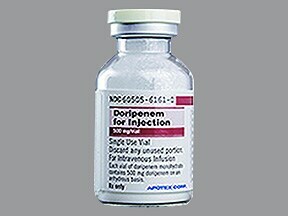 What conditions does Doripenem Vial treat? Pain/redness/swelling at the injection site, nausea, headache, or diarrhea may occur. If any of these effects persist or worsen, tell your doctor or pharmacist promptly. Tell your doctor right away if you have any serious side effects, including: unusual tiredness, pale skin. Get medical help right away if this rare but very serious side effect occurs: seizures. This medication may rarely cause a severe intestinal condition (Clostridium difficile-associated diarrhea) due to a type of resistant bacteria. This condition may occur weeks to months after treatment has stopped. Do not use anti-diarrhea products or narcotic pain medications if you have any of these symptoms because these products may make them worse. Tell your doctor right away if you develop: persistent diarrhea, abdominal or stomach pain/cramping, blood/mucus in your stool. List Doripenem Vial side effects by likelihood and severity. Before using doripenem, tell your doctor or pharmacist if you are allergic to it; or to carbapenems (e.g., meropenem), penicillins or cephalosporins; or if you have any other allergies. This product may contain inactive ingredients, which can cause allergic reactions or other problems. Talk to your pharmacist for more details. Before using this medication, tell your doctor or pharmacist your medical history, especially of: kidney disease, seizures, stroke. Doripenem may cause live bacterial vaccines (such as typhoid vaccine) to not work as well. Do not have any immunizations/vaccinations while using this medication unless your doctor tells you to. 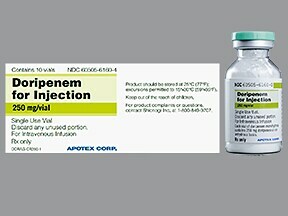 What should I know regarding pregnancy, nursing and administering Doripenem Vial to children or the elderly? Some products that may interact with this drug include: valproic acid. Does Doripenem Vial interact with other medications? Laboratory and/or medical tests (e.g., complete blood count, kidney function tests) may be performed periodically to monitor your progress or check for side effects. Consult your doctor for more details. Consult the product instructions or your pharmacist forstorage details. Keep all medicines away from children and pets. Are you taking Doripenem Vial? Are you considering switching to Doripenem Vial? How long have you been taking Doripenem Vial?